Peaceful garden surroundings. Apartment well equipped, including hair dryer, iron and ironing board. Property and pool well maintained. Hosts extremely friendly and helpful, nothing too much trouble. Extra friendly owners who took good care of us. Nice, clean and quiet place to relax. Private pool a lot of fun for kids. 15 minutes walk - many reastaurants and beach. Marina, Caitano and their staff made our stay very pleasant. It felt like home. The breakfasts were delicious, and the accommodation was private and scenic. room was big, comfortable, clean, swimming Pool was awesome. very silent place . Near to Sea beach. Food was also testy and home like. owners were very humble, welcoming and very supportive. Lock in a great price for Elegant Shades – rated 9.5 by recent guests! Elegant Shades This rating is a reflection of how the property compares to the industry standard when it comes to price, facilities and services available. It's based on a self-evaluation by the property. Use this rating to help choose your stay! 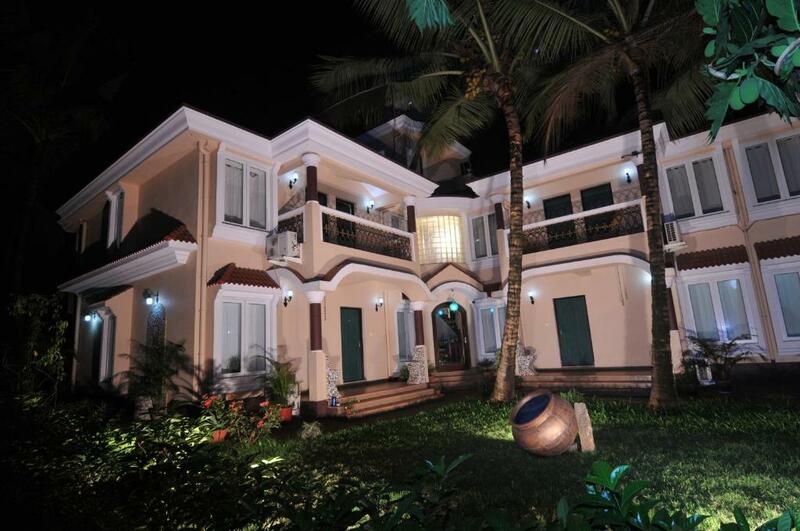 Nestled within a tropical garden, this property is located about 2,650 feet from Sernabatim Beach. Elegant Shades provides homely apartments equipped with a kitchen, living room and private balcony. Complimentary Wi-Fi access and parking are provided. The property is located about 6.8 mi from Margao Town's many tourist attractions and 2,650 feet away from Sernabatim (Colva) Beach. Dabolim Airport is located about 24 mi away. Fitted with a flat-screen TV, a fan and a study table, the air-conditioned apartment also has a kitchen equipped with an electric kettle, a fridge and a toaster. The bathroom features rain shower facilities. Guests can make use of the self-service laundry facilities. Room service is also available. 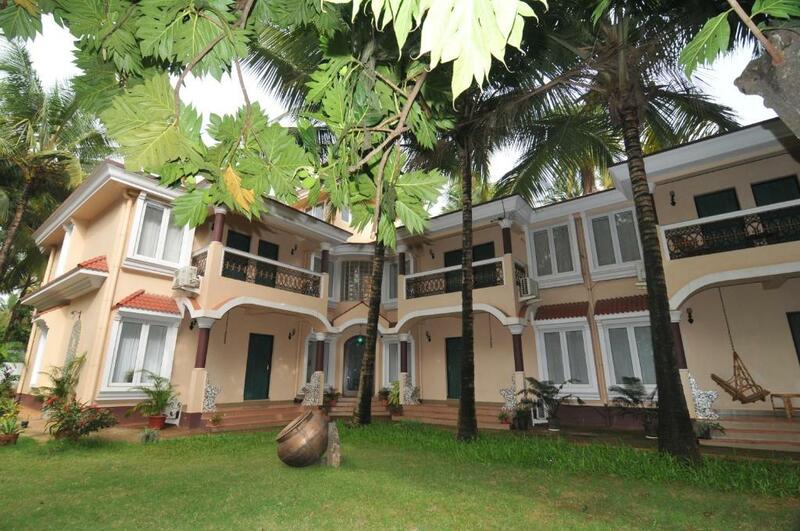 This property also has one of the top-rated locations in Colva! Guests are happier about it compared to other properties in the area. When would you like to stay at Elegant Shades? Fitted with a balcony, the air-conditioned apartment offers a flat-screen TV, a fan and a study table. 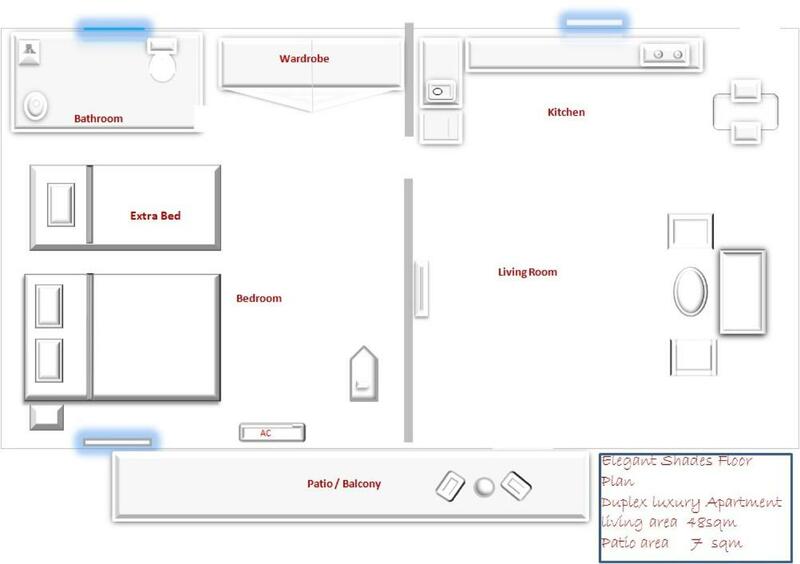 It also has a kitchen equipped with an electric kettle, a fridge and a toaster. The bathroom features rain shower facilities. The spacious air-conditioned apartment features 2 bedrooms, seating area and dining area. It is equipped with 2 TVs and a balcony. Each bedroom comes with a private bathroom. This twin room has a electric kettle, air conditioning and balcony. Elegant Shades is located in a village just a few minutes away from the usual hustle and bustle.The very fact that we have our residence at the property and available to our guest at any hour , gives our guest a sense of well being and cared for.It is spacious , tastefully designed and in nestled in natures beauty. We have a base in hospitality industry , had a career on board international luxury cruise liners ,have been around the world love meeting people in different walks of life . Now ,having our own business with my husband Mr. Caitano . We are located in the middle of 3 famous destination beaches the closest (10-15 mins walk)and the best being Sernabatim beach(10-15 mins walk). It takes 10 minutes walk to Colva beach on right and the same time to the left Benaulim beach from the calm Sernabatim beach .You can find water sports ,and few shacks on this beach . It has just the right amount of people .One can go riding on motorbikes , go bicycling , tuk tuk rides or just walk to beaches , restaurants, and supermarkets. House Rules Elegant Shades takes special requests – add in the next step! Elegant Shades accepts these cards and reserves the right to temporarily hold an amount prior to arrival. Please inform Elegant Shades of your expected arrival time in advance. You can use the Special Requests box when booking, or contact the property directly using the contact details in your confirmation. 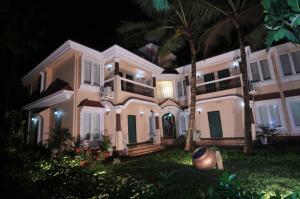 The property is a villa-like 1 & 2 BHK home stay and a quite premium one. It's very spacious and kept in excellent up-keep and yet very cozy. They offer very nice breakfast and home-cooked food, good old Goan fare. The Swimming Pool and toilets are kept really clean & hygienic. The two-bed apartment rented by us was on ground floor with a garden front and the pool close-by. The fixtures and overall fittings were of good quality. The beds were luxurious, kitchen had all necessary equipments and utensils in case you want to try cooking your own stuff. The hosts, Marina & Caitano, were very friendly and warm in their welcome. The tea and bread-butter ordered by us for afternoon tea-time was given as complimentary by them without asking. Same goes for the breakfast they served early morning on the day we left, for which Marine refused to accept a payment no matter how much we insisted. She is a really sweet person and what a hostess! We not only enjoyed our stay but also formed a friendship of sorts with the hosts who share our passion for road trips and food. An excellent choice for any family and though one may find the costs a bit high initially, the place and hospitality are worth every penny spent! Due to my own mistake we had an extra room and the cost was similar to a 5 star hotel for 2/3 star accommodation. Delightful hosts and friendly other guests. This was the best place we stayed in a month in India, the only bad thing was it was a 15 minute walk to the beach. But that meant it was pretty quiet. There was no watch men . That we've spent there only 7 nights. It was really hard to go away from there. Hotel is really wonderful, clean and comfortable! It is like a paradise. It was a pleasure to stay there. The owners of the place - are the nicest people that we've met in India. They were really helpful, gave us the possibility to try traditional India's breakfasts ) Location of the hotel is great - just 10-15 minutes to walk to the beach. We gave a '10' because we were traveling 4 weeks in India in hotels such as Taj, Radisson Blu, homestays, ...and this stay was real VALUE for money ! From the first moment to the last : welcomed by the owner at midnight (3 hours delay) with your name, with some food which we had ordered, with some drinks, ... the stay itself very easy going with no stupid rules, until the last moment that we were personally greeted by both owners for our departure. This feeling we had during the whole stay : somebody cares about you, about the property, about you as a guest having a very comfortable and relaxing stay. The room (APARTMENT) was very big, very comfortable, CLEAN, modern, you have everything and more than you need and expect ! A huge fridge, a very big kitchen with all utensils you need for some cooking, an iron board (wawww.. this was top), fan in the living room/kitchen, fan and AC in the separate sleeping room, a wardrobe which was big with enough hangers and not smelling strange, TV, a modern and clean bathroom with hot water (solar system), a comfortable and clean balcony with comfortable chairs and a small table, and a nice and light decoration in the whole apartment. The breakfast system is super, you give them a call to order your breakfast, they prepare it, inform you when it's ready and you can enjoy your breakfast near the swimming pool or in the garden. The same for the food, you can make an order in advance and enjoy FRESH fish or other nice dishes at the property. 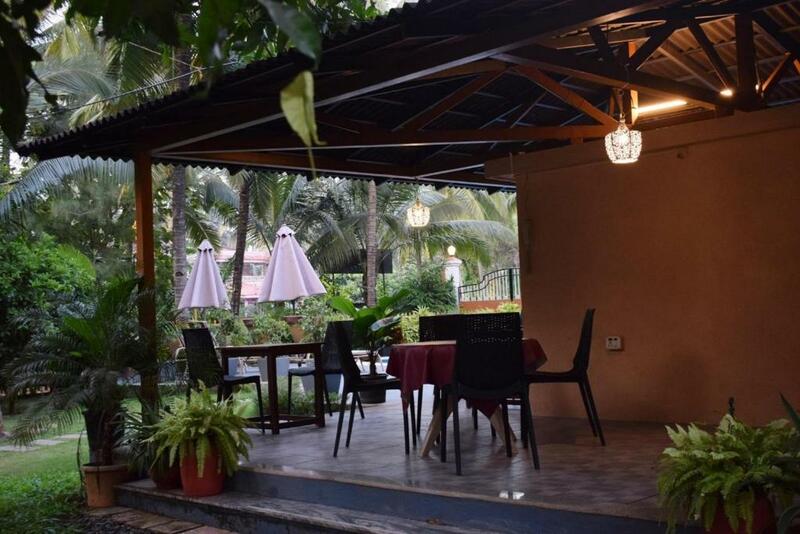 The property is about 10 minutes walking from the beach, set in a quiet area (some dogs and chickens around), under the shade of many palm trees, and having a beautiful and very well maintained pool and garden. Parking, laundry service, ...taxi service to the airport (only 35 minutes driving ! ), ... and probably more things which we did not discover. A place which is cared by with love, attention and where the guest is on the first place and not some stupid rules !!! The interior decoration of the apartment could be slightly more cosy. The setting of the property in a green garden was lovely. The hosts were exceptional and very kind looking after every need of ours to make it comfortable. The breakfast and dinners cooked were excellent and had the feeling of home cooked food. The swimming pool was a excellent and we made good use of it. Overall we were very happy to have selected Elegant shades. Nothing to dislike about the place , but yeah if the check out time can be changed to 12 noon or something it might be more easier and comfy for the guests. 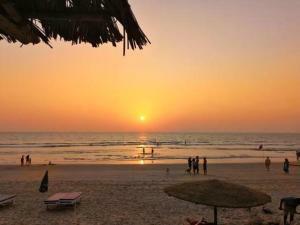 Place is nearby sernabatim beach ,beach is at 15min walking distance. The host were very welcoming and helpful in every possible way. 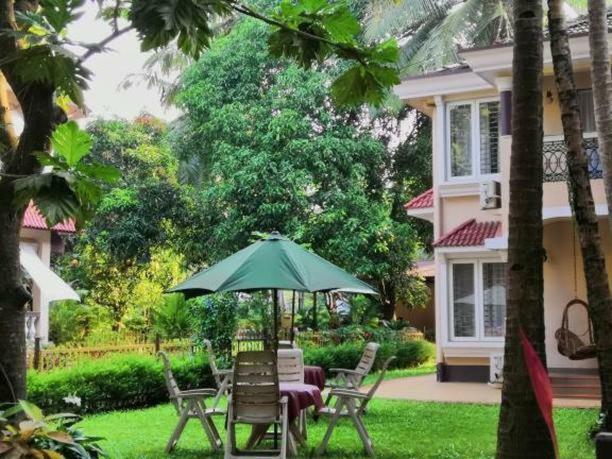 Rooms are tidy ,comfortable with all the basic amenities, its a pleasant place for couples or family.The location is bit off from the market area , It’s better to have a hired vehicle than paying for a taxi as taxi services are bit expensive.